Renovating your bathroom doesn't have to cost an arm and a leg. There's plenty of ways to significantly improve your bathing space, without emptying your bank account. Here's how. We can't all have the luxury of living in a multi-million dollar mansion. But that doesn't mean you should settle – just get more enterprising. Small bathrooms can be made to feel more spacious through various strategies. Check out our guide for some clever ways around a lack of space. 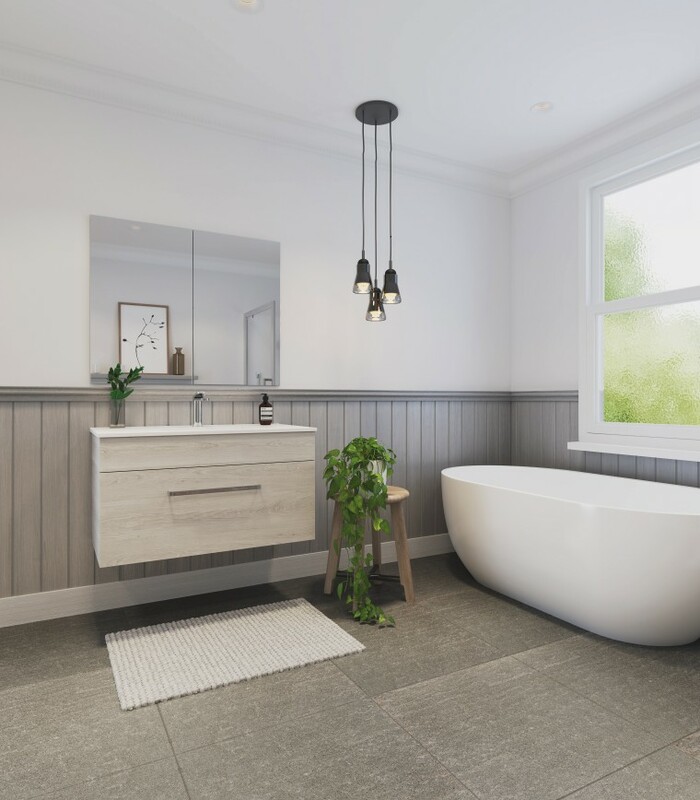 Whether it's the visually trickery of added space through mirrors or flooring, adding a splash of paint or utilising corner space, there's plenty of ways to make your bathroom look and feel larger. We also recommend floating vanities as another way of creating the illusion of more space (if the budget allows). If you have enough time (and own the home), you can knock down a wall to give your bathroom the open-plan treatment. 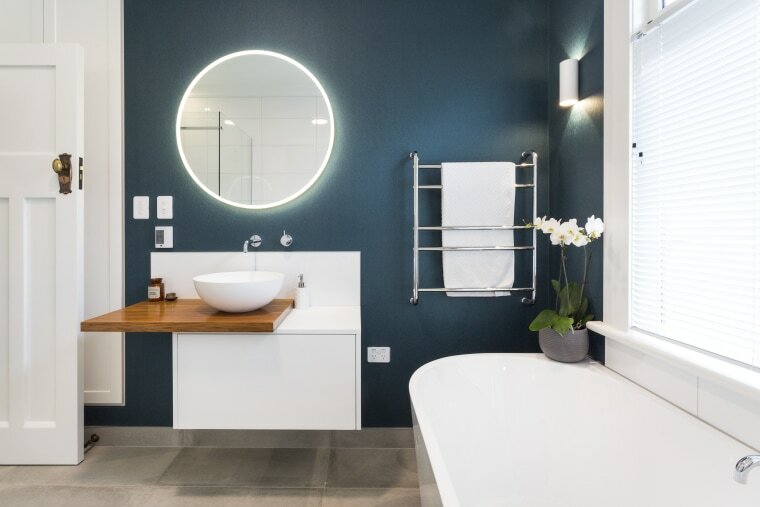 The round LED-edged mirror and electric teal colour on this wall combine with the natural light of the nearby window, playing off the rest of this bathroom's more traditional features. 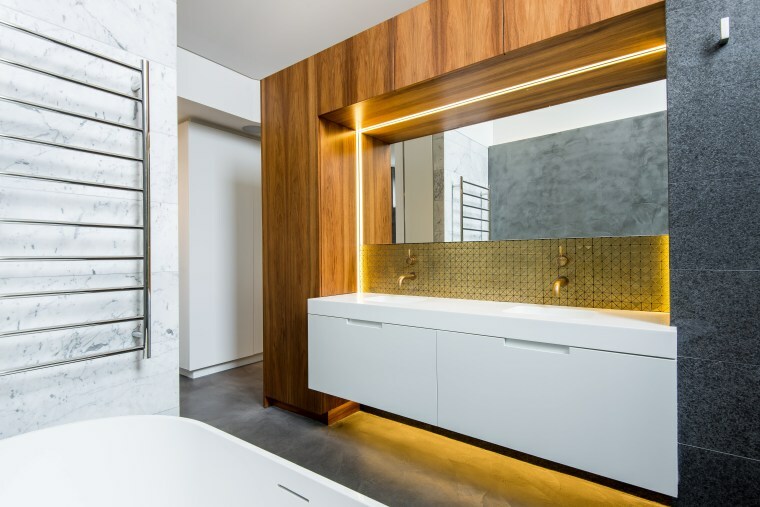 Increased natural light will make your bathroom feel more welcoming. We mentioned mirrors before, which on top of making your bathroom feel spacious, in reflection, also refract light. The same effect can be created with reflective tiles or mosaics. Always a classic, the use of white surfaces really does help a space feel much brighter and more inviting. However, if you're sick of all white, go for another light hue, or even something brighter and more dynamic. Your bathroom will still benefit from an added sense of lightness. Keep in mind that lighter colours tend to show dirt more than darker tones. For artificial lighting, LED lights are the way to go. They're far more energy-efficient and last longer than their traditional counterparts. 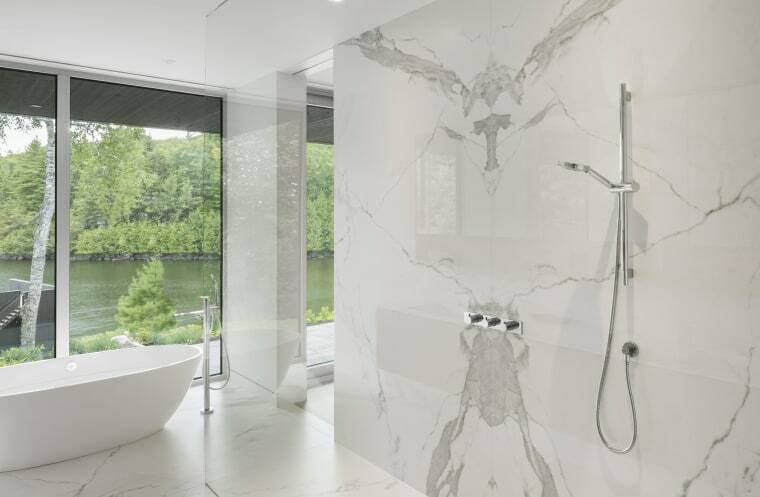 In terms of bathroom walls and flooring, porcelain tiles still reign supreme. Porcelain is hard-wearing and some options can relatively inexpensive while still looking great. Vinyl is another inexpensive yet practical flooring option. We recommend using larger tiles in your bathroom, as this both increases the sense of space and minimises grout lines, making cleaning easier. To ensure the best results, getting a good tile setter will ensure an expensive looking finish. The durability and stain-resistance of stainless steel make it an ideal option for basins. For vanity surfaces, quartz and granite are now popular in the bathroom as well as the kitchen, also due to their hard-wearing properties. Decorating is a low-commitment way of renovating your bathroom. If you're unable to make major renovations, redecorating can still do wonders to the look and feel of your bathroom. One of the easiest and cheapest ways to rehaul your bathroom is by changing the fixtures. Chrome is a great alternative to more expensive materials like bronze. It's cheap, hard-wearing and still looks great. Does the rest of your home have any unifying decor themes? If so, carrying some of these elements into the bathroom ensures continuity as well as adding visual interest. Green walls improve air quality in your bathroom, on top of their aesthetic benefits. The good news is, a few well-placed pot plants work as an alternative to green walls and have a similar effect. Changing smaller accessories such as cabinet handles, floor mats and soap dispensers can also impact your bathroom.